Wow, what an excellent Huntingdonshire ARS Radio Rally this year, the WX was definitely on our side. We had over 300 punters thru the gate and 52 Traders in the hall and on the field. We had traders from S Yorkshire, Essex, Lincolnshire and even Cornwall. Many of the traders had moved on to us from the Milton Keynes Rally on Sunday, and on arrival had started setting up their stalls as we arrived to arrange the hall and parking area. We had 12 stalls in the Hall and 40 on the field. The Car park was filling up fast and the great job was done by the local RAF Cadets who were very smart and well looked after by their leaders. We supplied them with a burger and drink and we shall be visiting the Squadron soon to hand over a cheque for their funds. A Big Thank You to those few who helped set up on the Sunday evening and all those members who put a lot of effort into helping from 7am Monday morning with Car Parking, Gate Operating, the Bring and Buy stall and just meeting and greeting on behalf of HARS. As many of you know CHR has had many posts about young people and are they still interested in Amateur Radio. While looking for posts to put on the website I came across this interesting piece. Albeit the story dates back some seven years this post is about a girl and amateur Radio. Although her interest is in satellite communication this article is almost a primer for any new ham and what you need to get up and running. On Saturday 12th August, 18 members of the Huntingdonshire Amateur Radio Society (HARS) and some Station Managers visited the Radio Display and Mini Museum of 2E0IEG (Marc). Rebecca (owner of Glebe Farm) and Marc (2E0IEG) kindly opened up their facilities and provided refreshments for us to view a large number of WW2 Radios and Post War equipment that Marc has collected over many years. We were impressed that he had managed to get a large number of his radios up and working. A friend brought over an old Airfield Fire Engine called HENRY that Malcolm (alias Henry – M0OLG) sat in to have a play and ring the bell (boys and their toys). You know he is always looking for a new vehicle to go /Mobile. A Big Thank you from Huntingdonshire Amateur Radio Society to Rebecca and Marc (2E0IEG) for hosting and looking after us so well. 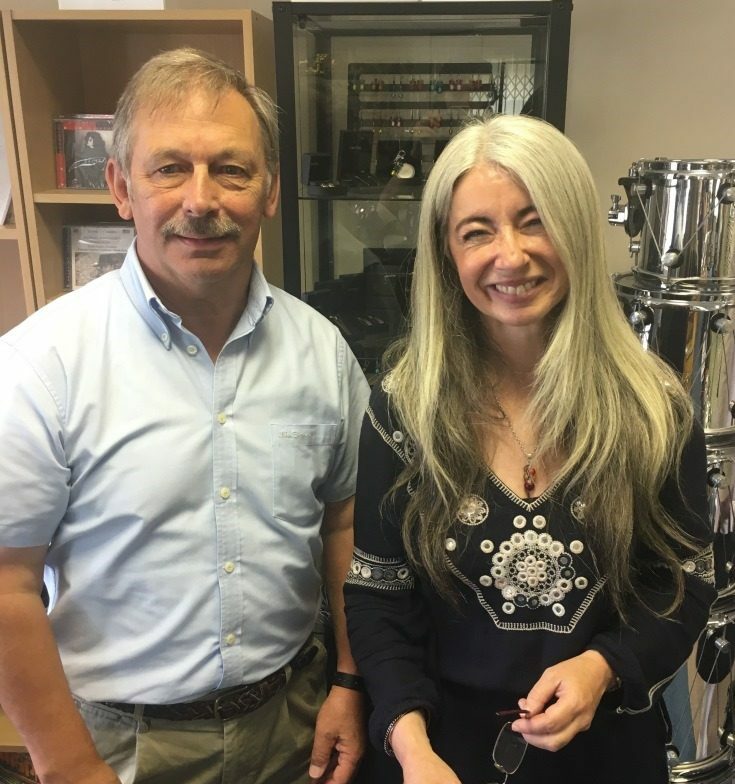 The Huntingdonshire Business Network (HBN) had a fascinating visit to see Dame Evelyn Glennie, renowned solo percussionist – and discovered that there was also a surprising amount of business acumen needed to be an independent artist in the modern world. It was time to answer “Evelyn Glennie”. Stopping to think about where you wanted to be, what you wanted to achieve and how to get there was that key stage at which so many of us small businesses fail. Even artists have to deal with the practical realities of when to get paid, logistics of moving material and products around, and most of all, business development. Used to having shattered preconceptions of what a percussionist does, Evelyn and her team began to change the rules in how an artist finds work and gets paid for it. Rather than relying simply on agents, Evelyn increasingly used social media to reach out both to the audience, the venues and promotors who organised events. Facebook and particularly Twitter overtook paper advertising – and also reached out to new audiences. Taking control of her own business also meant being open to new opportunities and collaborations – with dance groups, scientists and of course other musicians. There was also space to engage in more socially minded activities. And of course there are the masterclasses, speaking engagements etc. A lovely vignette was the story of The Letter. It had been a busy tour and Evelyn returned tired and expecting the usual mass of accumulated letters. Her desk, however, was empty, bar a tray with a solitary letter and a cup of tea. Oh my, what could this portend? Bad news perhaps? It was the letter from the Palace notifying Evelyn that she had been chosen to be Dame Commander of the Most Excellent Order of the British Empire (DBE) in the 2007 New Year Honours. And this year, she was appointed to the Order of the Companions of Honour (CH) in the 2017 New Year Honours. When the tables were turned and we recounted our varied business interests, Evelyn was not only genuinely interested but saw connections and links either to her experience or possible useful connections. It was a relaxed, personable meeting as conversation and questions bounced across the room, intermingled with laughter. Unpretentious, unselfconscious, Evelyn Glennie was a gracious host and we all left grateful for an informative, educational and entertaining couple of hours in conversation shared with other local small businesses. And a special thanks for being game for our group photo with the newest, if apparently reluctant, human percussion instrument! Another outing on Saturday 1st July 2017 for Huntingdonshire Amateur Radio Society, this time to support Buckden Village Hall and their Village Fete. We have our club meeting here on the 2nd and 4th Thursdays each month. We had been given our location on the sports field by the Festival Committee about a week in advanced, but on arrival at 8am on Saturday 1st July, M0VTG and G4KLE we were informed that we had now been allocated a new pitch between the Girl Guides Gazebo and the extra-large Trampoline Frame. Unperturbed we did a quick recce, changed our plans and started to lay out our Gazebo. We had expected Steve (G1KWF) to join us but he had been directed to the old location and watched M0VTG & G4KLE fighting in the wind to keep the Gazebo on the ground, he decided to join us after it was up with Malcolm (M0OLG) not far behind. The antenna was erected at the rear of the Gazebo, an Off Centre Fed Dipole (OCFD) made by M0VTG, safety tape around Masts and the trusty IC7200 was fired up and tested. We decided to use Battery power and Steve brought along a large 12v battery he took off a tractor we think. Our first contact was at 09:16 with PA3GFY (Rob – Netherlands) on SSB giving us 5/7. Throughout the day we were visited by Brian (G8CHC) and Phil (G0AYX) plus visits by Richard (M6TXR), Clive G3NKQ – after we worked him on the key from his QTH in Perry) and Stig (G1MVF). We even had a Radio Amateur from South Africa – John ZR6ART – who was visiting his son in Buckden. We managed to total up 26 contacts in all, with 22 CW – working into Norway, European Russia, Hungary, Czech Rep, Netherlands, Belgium, Germany, South France and even Hartford (G4LHI). Bands use 40m, 80m, 20m and 30m. Our last contact was at 16:37 on 30m CW with Knut – DL1DTX (Dresden), and then M0VTG, M0OLG, G1KWF, G1MVF and G4KLE dismantled the station and cleared up the site until next year. Malcolm (M0OLG) offered us the use of his caravan as our temporary home, so it was decided after a recce in May that we would site ourselves at the back of the museum’s main building which gave us enough estate to put up masts and antenna. On the afternoon of Friday 23rd June, G1KWF, M0OLG, M0VTG, G7DIU and G4KLE followed the caravan onto site and positioned it on good standing then proceeded to erect 2 masts, one for centre of the G5RV (next to the caravan), one at the far end of the G5RV – we had decided at the recce that the other end of the G5RV would use a light fitting at the end of the museum building (an old lamp so no interference). Malcolm (M0OLG) stayed with his caravan overnight, he was invited to a BBQ by the Ford Corsair Owners Club but had an early night instead. Gerald (G8ALK) and Carol (G1KGV) visited Malcolm in the evening. On Saturday 24th, we all paraded at 08:00hrs to start operating, Steve (G1KWF) had already set up the IC7200 and tested all equipment so we were ready to start. Malcolm made the brew and we had our first contact into Kent at 08:20 on 20m with a report of 5/9+20db – a great start. We also contacted Roger TM53IMW for the second year, who is operating a similar rural museum station from Musée de l’Évolution Agricole, JUVIGNÉ , France. We had a number of visitors, operators and helpers throughout Saturday and managed to work a total of 65 contacts SSB and CW on 20m, 40m, and even 15m. Even an offer of some farm equipment over the air for the Museum. We closed the station at 16:50 and left Malcolm again, but this time he was visited by Olga (his Station Manager). We re-established the station at 09:22 on Sunday, working to the IOW Net. The conditions were not the best but we managed to have 58 contacts this day again split between SSB and CW, mainly 40 and 80m with a few skirmishes onto 20m and 17m. A number of visitors dropped in to give their support and partake in a cup of tea and even a biscuit if Malcolm had not eaten them all. We closed and dismantled the station at 15:25. Total contacts for the weekend was 123 which included 19 other Museums. Thank you all again for your help and continued support to the Special Event stations that are put on for all members of HARS. Planning for a Special Event station at St Mary’s Church, Buckden had started back in April this year when we said we would support the Church at Buckden in setting up our station for the “Churches and Chapels on the Air” event. It was decided to erect the G5RV Antenna in the grounds of St Mary’s Church on the Friday before the event so as not to interfere with other activities and events that the church had planned for on the Saturday. The erection team of Steve (G1KWF), Brian (G8CHC) and Mervyn (G4KLE) arrived at 10:30 on Friday. From a previous recce we had identified two suitable trees that would be used to hold up the ends of the G5RV. After a couple of attempts to throw the lead cord over high branches, we succeeded in hoisting up the antenna. We confirmed with the Church Wardens our area within the Living Stones Room, which had good access to the outside via the fire door. Weather on the Friday was dry and very warm. On Saturday morning we arrived at the church to very different weather conditions, it had been raining all night and it was still raining quite heavily (good decision to erect antenna on Friday). Unfortunately the rain had worked on the ropes holding up the G5RV and with shrinkage; one end of the antenna was now laying on the ground. A quick repair and we were in business again, but with a slightly lower to the ground antenna. The Icom 7200 was installed, earth fitted so up and running by 09:20 (local). Our first contact was at 09:30 with Steve on the Mic talking to GB1SKC, St Keverne, Cornwall – the operator at the other end was Ivan, a former Chairman of the Huntingdonshire Amateur Radio Society, a great start. We had a very lively period where we had QSO’s with a number of Churches and Chapels including Gloucester Cathedral, who had erected their Long Wire from the top of the Cathedral – approx 200 feet high. We also had a visit by Bishop David (Bishop of Huntingdon) who showed a great interest in our activities and asked many questions, we also managed to let him take over the Mic, unfortunately we had no QSO’s at the time. During the day there were a number of Ladies and Gentlemen from the church visiting for Tea and Cakes who came over and were very interested and asked questions about Amateur Radio. Members on Saturday were – Steve (G1KWF), Brian (G8CHC), Richard (M6TXR), Clive (G3NKQ) and Mervyn (G4KLE), who all took turns in Operating and Logging. We also had a visit by Stev (G1MVF) from Leicester. We would like to thank the Revd Jes Salt and all members of St Mary’s Church, Buckden for making us very welcome, and could we do it again next year.